Your child's first communion is a very important religious rite of passage. 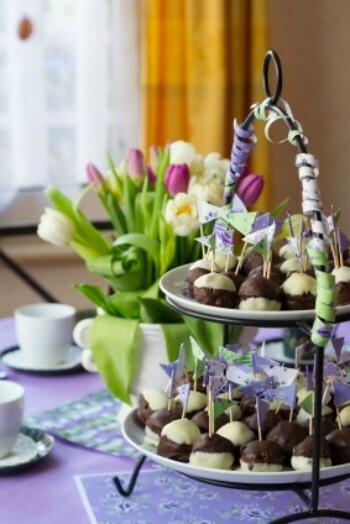 This is a guide about first communion party ideas. Communion is around the corner. My tips is to Moms who want to enjoy the day, yet can not afford or do not want to cater the food for a backyard party. Make dishes such as: Chicken Parmagiana, Chicken Cacciatore, Baked Ziti, Sausage Pep and Onion, ahead of time in the chafing pan inserts. Give the dish to a friend that will not be at the church and ask them to bake the item before the party starts and to bring to the party when they arrive. The dish comes to your house hot and ready to serve! Do you have to have it the same day as mass? You dont, especially if it will conflict with friends parties. My daughter is 7 years old and will be receiving her First Holy Communion this year. We will be hosting a luncheon party after the church service. What happens at the party and what sort of prizes/games should one have? I'm new in this country and don't know what happens at one. Please help and thank you. I would ask the minister or priest what is normally done at that particular church. My church doesn't do any parties or such or prizes. Are there any others getting baptized before here that you could observe or any who have already that you could ask the parents? How do I arrange a party for first holy communion of my son? Much depends on time of day and your budget. If it is a morning Mass, you could have lunch or brunch, rolls with sliced meats and cheeses, salads, etc. If it is an afternoon Mass, thing cake and punch, If evening Mass, hors d'oevres or snackie things. Remember that this is not a big gift-giving occasion, more of a religious deal, so gifts of a bible, prayer book, rosary, etc are appropriate. How can I host a First Holy Communion party for my daughter? My 8 year old twins were baptized a week ago and we hosted a BBQ at our house afterward. We kept it simple by serving hamburgers and hot dogs, plus several salads (pasta & Cool Whip-fruit cocktail-mini marshmallows-dry Jello), fresh fruit, giant cookies, and cheesecake. We don't drink alcohol so drinks were soda and CapriSun. We had about 30 people. What games/activities would be appropriate for my 9 year old daughter's communion bearing in mind the dress and occasion. I need some ideas for activities for my little brother's first communion. I need some ideas quick! It is in 1 day! 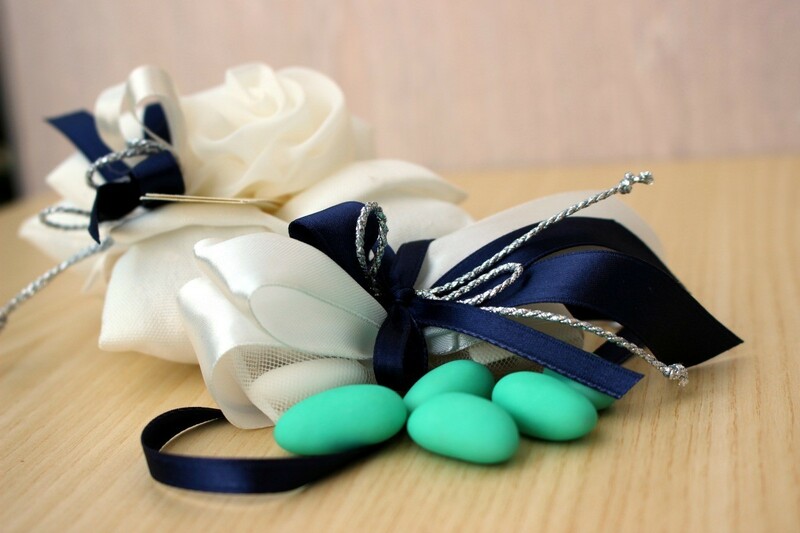 This is a guide about first communion party favor ideas. 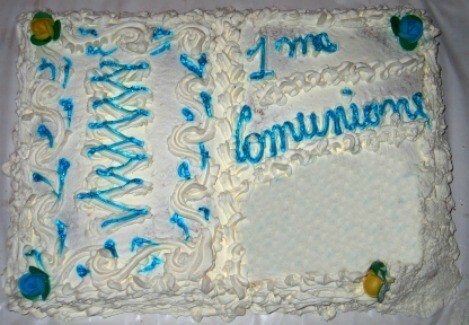 Some families have a party for their children when they make their first communion. Can I get some planning tips for a cousin's communion? I would like advice on games for children as well as adults. Thank you. I am looking for First Communion celebration ideas. We had our daughters first holy communion last year and another one doing it again this year. Her dress was beautiful so we took her for professional pictures and what a keepsake. The day of the professional pictures I brought her home and took our own pictures which I used in her invitations and her thank you Hershey bar candy wrappers. I converted a pink baby announcement to a communion invitation which was pink so we went with a pink and green theme. We rented tents and I tied tulle around the legs of the tent with pink flowers on each. We ordered round tables and each table had a picture frame from the dollar store on it with again the pictured we had taken along with a vase of pink roses and balloons. All the table cloths were pink and the tableware was green. It was beautiful. The cake was ordered from a bakery and it was an ice cream cake which worked nice because I didn't have to buy ice cream separately. We also had a party tray of finger desserts (eclairs, cookies, etc) and a chocolate fountain that you could dip strawberries, cookies, and pretzels in. I am a catechetical leader at a Catholic church. The children in our parish draw a picture of themselves as they think they will look on their First Communion Day. We turn these creations into blank notecards that can be used as invitations or thank yous. My daughter is celebrating the sacrament this year and created her own "holy card". She drew a beautiful picture of Jesus on one side, and her favorite scripture verse, along with her name and date of first communion on the other side. My son is making his First Communion this Sunday and we are keeping things pretty simple. He understands that this is a gathering of family at our home and not a huge party. We are going to have around 30 guests. We are doing a few simple pasta dishes, one of which I am making myself. A friend of mine is making the cake and making some chocolate covered Oreo cookies with blue crosses on them. Other than that we are just doing chips and soda. Thank you to all of you who brought the focus back on Christ. I was beginning to get carried away on the whole party thing and was thankfully brought back to the real reason of this celebration. We will fix our eyes on Jesus. My daughter will be celebrating her first communion in December and I want the main focus to be Jesus. We are having a gathering in our home after the mass. I will be making a dinner the night before and will set up in the backyard. I will have two buffet tables, and one drink table, which will have wine and soda. (We live in Florida). I also plan to have the chimney in the yard lit up. Our theme will just be silver table cloths and candles. The invitation were printed at Hallmark for $40. The cake will be from Publix for $40. I'm planning to spend about $200. in food, drinks, and paper goods. As gifts for my guests I have purchased Yankee Candles at $6.00 each from Ross Stores (9 in total). My daughter's dress was purchased at David's Bridal ($100.) and I'm planning to surprise her with a scrap book with things collected that she has made in regards to her learning. We will have the play room set up with Wii and play station (14 kids under 10 will be in our home) and no games other than that are planned. It sounds expensive, but I have limited a lot and I just hope that everyone has a nice time.